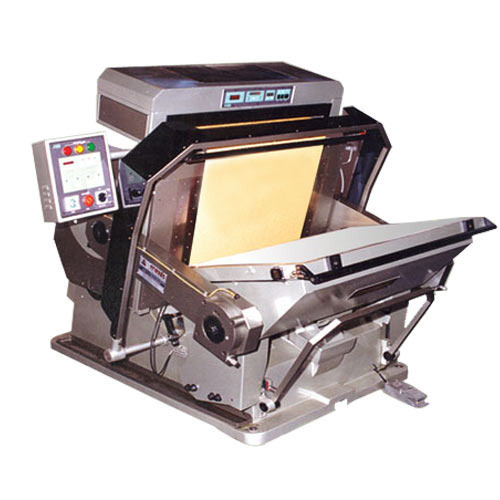 Pioneers in the industry, we offer leaf and foil printing machine and foil & leaf printing machine from India. We are eagerly engaged in offering a comprehensive assortment of Leaf and Foil Printing Machine. Available Sizes: 15" x 20", 18" x 24", 22" x 32", 28" x 40"
The sizes are standard, any special size required can be supplied on Request. Note: In the interest of product upgradation/improvement, the manufacturer reserves the right to change the specifications and features without notice. There is No Need for extra machine for hot foil stamping. You just put this Hot Foil Stamping Attachment on Die Cutting Machine & You are ready for Hot Stamping. Saves your great Costs. Comes in Two Models, With Single Roll, With Double Pull, so you can have up to Two impressions at a time. Hot Foil Stamping Machine Attachments:- Attachment of hot foil unit with Single Pull and Double Pull. Heating Plate Rewinding Unit:- Rewinding units are separate for each foils. Jumpers:- Jumpers are designed with advanced technology to minimize wastage of foils. In the interest of product upgradation/improvement, the manufacturer reserves the right to change the specifications and features without notice. Looking for “Leaf and Foil Printing Machine”?